Critical thinking and leadership development through the sport of fencing. a Legendary Personalities website, which is produced by Geoffrey Drew Marketing, Inc.
© 2008-2015 Geoffrey Drew Marketing, Inc. It is prohibited to use any graphics in this web site without the written permission of Geoffrey Drew Marketing, Inc.
Website Geoffrey Drew Marketing, Inc.
Dr. Arthur Tauber, center, wearing his special protective sleeve and padded vest, weighs in during a practice bout in the old gym in the basement of the main building of Yeshiva University to clarify a defensive technique and to help an emerging "Tauberman" make the most of the learning moment . 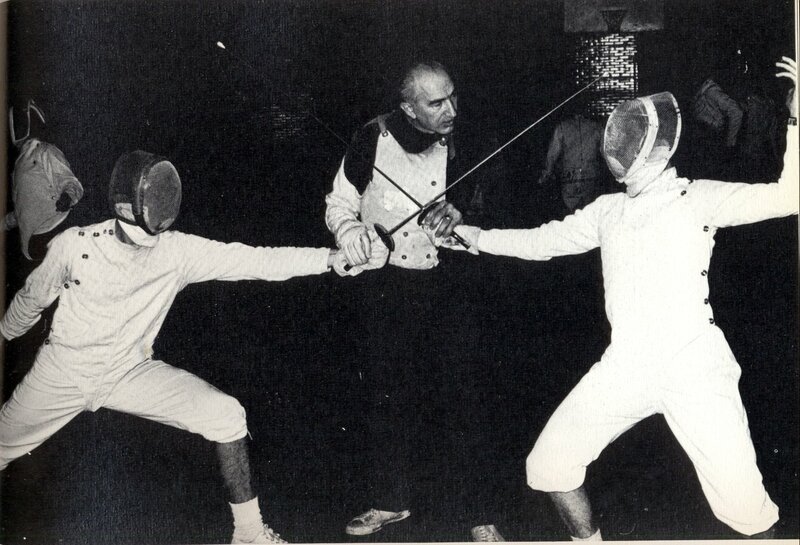 If anyone is able to identify the fencers in the above photograph, please contact us.